Unless you want to manually weigh and dispense the powder for every single round you reload, a powder measure is going to be an essential piece of reloading equipment. 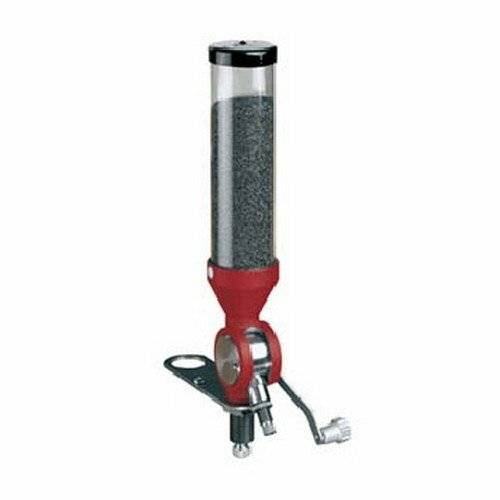 While all reloading powder measures have the same purpose, there are brands that perform better than others and offer advanced or unique features. Regardless if you have a single stage press, a turret press or a progressive press you should have some quick, accurate and safe way to measure how much powder you use. In this article, we are going to outline and discuss five of the best powder measures on the market. If you have a powder measure that is inconsistent or you are simply looking to buy the best measure available, check out these reviews for a safe, accurate, and quick way to measure how much powder you use. When it comes down to it, the most important aspect of a powder measure is how accurately and consistently it dispenses powder. There are some great features in powder measures that are designed to help achieve the best accuracy and consistency. For example, a metal hopper is preferred if you live in a dry climate where static electricity could cause problems. Moreover, many of the newer powder measures have a baffle system in the hopper, to make sure the amount of powder in the hopper doesn’t affect the charge. These features make a better product, but consider that a lot of the consistency from a measure comes from proper operation. You do not want to buy a new powder measure only to find that it works very well with large charges but starts to lose accuracy with smaller charges. That is why it is necessary to buy a powder measure that is easily adjustable across a wide range of charges. You might find that some powder measures are better at dispensing large charges, and some are better with less powder, but the best measures will be accurate and consistent across the entire range. Other things to consider when buying a powder measure are any additional features. Some may come with extra hoppers, universal stands, or any number of gadgets to make it function more efficiently. Lee Precision has been famous for almost 50 years for producing affordable and high-quality reloading equipment, and the Lee Powder Measure happens to be one of its most successful products. It is a great measure, but with any volume-based powder measure, there are a few things to be aware of. First, the plastic hopper can be an issue if you live in a dry climate because of static electricity. Also, this measure produces consistent results under specific conditions; but as the powder level starts to drop, or if you jostle the hopper around frequently, it can result in your charges being off. This is because the powder is measured by volume so as it starts to settle, your volume can change. If you want to run the hopper from completely full to completely empty, or do not have a steady workbench, this measure may not be the best option. I would recommend keeping the measure between roughly half and three fourths full of powder, and with consistent operation, it will give you consistent results. This measure also has some really nice features such as being able to calibrate it easily. Additionally, it can be used with the included bench mount stand or used with a universal charging die. If you are looking for an affordable but quality powder measure, the Lee Perfect Powder Measure is one of the best options for you because it is simple to use, feeds smoothly, and is easy to adjust. We also highly recommend Lee Precision’s hand priming tool. This Hornady powder measure may be a little more expensive than some of the other popular models, but it is worth the price with its versatility and advanced features. It can measure from one-half grain of powder up to 265 grains. It also comes with a standard Lock N Load Metering insert. When you want to switch to a different caliber, all you have to do is push the Lock N Load release button, and insert a new metering insert. Although it still has a plastic hopper, it is capable of throwing very accurate charges and is adjustable for 1/10th of a grain. 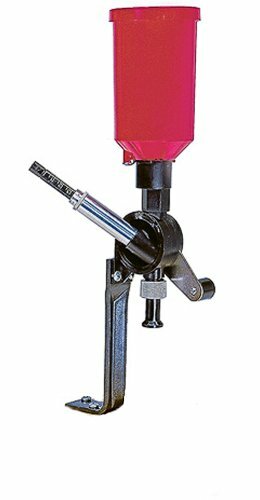 This powder measure does not come with a separate bench mount but does have a mounting plate for a reloading press. The versatility, flexibility, and accuracy that this powder measure offers are the reasons it is one of the most popular powder measures on the market today. Lyman is yet another well-known brand in the reloading industry, and for good reason. They make excellent, high-quality equipment that has developed a reputation for being dependable. This powder measure is no different and has several features that make it stand out from the competition. Most notably, the hopper has three adjustable slides for width and depth, ensuring an accurate load every time throughout the whole hopper. This also helps it load more reliably and consistently across a wider range of powders. 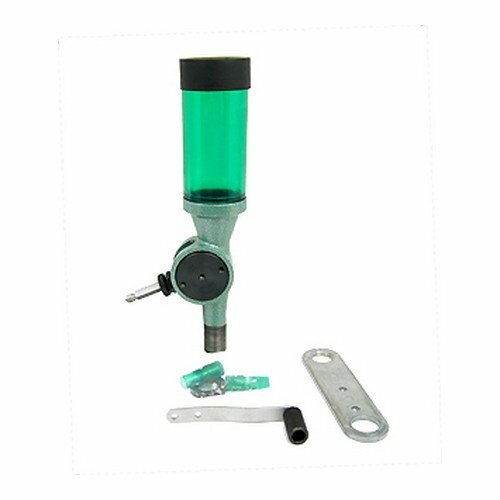 No funnel is required with this measure and it mounts directly to a bench or reloading press. Another nice feature is the attached knocker, making sure you get a full charge every time. Aside from the reloading specific features, it has a very solid feel to it unlike some of the cheaper plastic measures. If you are looking for a high-quality powder measure that will last a lifetime and then some, I would recommend you check out the Lyman Powder Measure. The RCBS Uniflow Powder Measure is recommended if you are looking for the most accurate measure. While it still measures by volume, users report being able to achieve charges plus or minus 1/10th of a grain. This is another well-built and solid powder measure that has some really nice features such as a numbered measuring screw. The screw can be used as a reference when setting up for a different sized charge. Furthermore, this measure works well with smaller powders and does not leak. Overall, this is a great powder measure that is easy to adjust and throws accurate charges. RCBS also makes some of our favorite presses and bullet pullers. Frankford Arsenal makes a lot of feature-packed reloading gear at a budget price and this powder measure is no exception. It can measure from 0.8 up to 120 grains of powder. What is really nice about this measure is that it comes with two different benchtop mounts. A high clearance mount and a side mount. It also has a quick disconnect to dump out the unused powder. A lot of the extras that you have to buy separately on some of the other measures come standard with the Frankford Arsenal, such as baffles for the hopper to help ensure a consistent charge. The powder measure is capable of throwing accurate charges and works well even with small powders. Easily adjustable, you won’t find another powder measure in this price range that comes with all the extras of this measure. 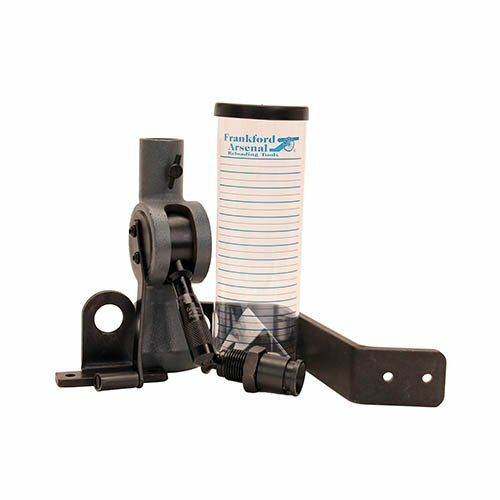 If you are looking for the best powder measure for the money, you should consider the Frankford Arsenal Platinum Series Powder Measure. If you are just getting started with reloading, or have been manually weighing your powder for your reloads, you are going to really enjoy having a powder measure. It makes the process much more streamlined and simple. Even though these volume powder measures are very accurate, it is always a good idea to occasionally double check your loads for safety. When choosing a powder measure, look for one that includes the features you need. For the typical rifle round, a basic powder measure like the Lee Precision will work just fine. If you are looking for a feature-packed measure that is still in the budget price range, consider the Frankford Arsenal. But if you want to upgrade your current measure or if your budget is a little larger, the Lyman and Hornady measures are great options. No matter what you decide to purchase, you will surely enjoy reloading ammo faster and more accurately with any of these great powder measures. We know that each of these products comes with a manual but we still suggest that you invest in on of our overall recommended reloading manuals since this is an inherently dangerous hobby.